I started my FI journey in late 2012. I was with my family, wandering around a thrift shop and I happened upon a copy of The Total Money Makeover by Dave Ramsey. I remember thinking to myself, “Can this guy really change my life for a $1?” Short answer was yes, he could. I read his book and I was hooked. I was ready to start building an emergency fund, killing debt, and building wealth. I still think Dave’s baby steps are a great start for anyone wanting to get control of their money. As I was working my way out of debt and taking control of my money, I started listening to Dave’s radio show. The radio show, in turn, led to podcasts and blogs, and the entire FIRE movement. In July 2013, I switched employers. While I took a pay cut, I started to receive benefits and was considered a full-time employee in my working career. I knew the importance of 401k contributions, but had to wait an entire year until I was eligible. Unfortunately, I didn’t contribute to an IRA because I wasn’t aware of them. Even though I had read Dave’s book, I was only looking at the first two baby steps: the starter emergency fund and paying off debt. Later, around the summer of 2014, I was trying to keep up with the Joneses and knew I needed to increase my income. I decided to take out student loans for an MBA to have an opportunity for a higher-paying career. I believed the salary and career advancement I’d get as a result would pay off the degree faster than it would take to complete it (and I was way wrong). I was fortunate enough to be with my employer long enough to receive a bit of tuition assistance. That assistance brought the cost of my MBA down from $25k to $20k. Adding the $20k to the other $5k of student loans I had previously, I wasn’t exactly controlling my money as well as I could have. I wasn’t intense about debt payoff and $25k+ worth of debt seemed daunting. I would later find the FIRE community and “supercharge” my savings (and income), so to speak. In 2016, I met one of my future (and now past) managers who would introduce me to Mr. Money Mustache. Although he told me about Mr. Money Mustache’s blog, I decided I knew everything about money because I could quote Dave Ramsey backward and forward. Later that year, I found out about podcasts. I was looking for a way to download Dave’s radio show without using up all my data and because I couldn’t get a decent signal at work. I don’t remember the exact details, but I came across “So Money” with Farnoosh Torabi. Farnoosh had some amazing guests whose podcasts I still listen to today. I first heard Mr. Money Mustache, which led to the Mad Fientist, which in turn led to ChooseFI, and so on. ChooseFI quickly became one of my favorite podcasts. There was something encouraging about Brad and Jonathan bringing on different guests and helping me build my own FI journey as it was developing. I felt they didn’t say only one way was the right way. As the podcast was growing, I felt less guilty about diverting away from Dave Ramsey and switching to value-based spending. I was able to pay off debt and save money according to my situation as I saw fit. I was still working for the same employer from 2013. Although I was paying minimums on debt, I wasn’t paying off any debts. Because my income was low, it felt like I was chipping away, but couldn’t completely wipe away my debts. The student loan I took out for my MBA just seemed impossible. I had been on the income-based repayment plan since I started paying on it and I am still on that plan more than four years later. In winter 2016, I met my wife. The first year or so we were together I struggled to explain my FI plan to her and she struggled to understand it. Working toward FI has led to more arguments than I care to count. However, it also has led me to increase my income and decrease my debts while still making less than the average household income. One agreement we have come to is about our apartment temperature. Unlike a few other bloggers, our apartment stays at a comfortable temperature. As a result, our electric bill is one of the higher expenses that we are willing to accept. One way we have saved money is we have a travel budget with low costs. Our vacations usually consist of going to Tennessee for a week where we can stay with her family. Otherwise, we travel around our state (Ohio) and just do day trips on the weekends. It’s enough to satisfy our travel desires, as she does not enjoy flying and I’m fine with not traveling out of state often. In summer 2018, I had a breakthrough. I decided to put in my two-week notice, take a month sabbatical and find a different employer. In my new position, I increased my salary to a point where I can be aggressive with debt paydown and savings while continuing to cut my expenses. I am grateful for my working career as I have been very lucky to have managers for whom it is enjoyable to work. As far as where I am currently in my FI journey, I am excited. I was able to pay off my first student loan debt, which had a principal balance of $10k, in 10 years. Next up, I am working on paying off my car, about $6k. Afterward, I plan to start paying aggressively on my student loan for the MBA and changing my repayment from the income-based plan. I also have a few side hustles I’m working on and am excited about being a “solopreneur” on the side. I am working on my first book and with a team whose primary focuses will be consulting and coaching of different varieties. My FI goal isn’t fully determined yet. I want to reach FI so that I can alleviate some of my stress and anxiety. I have always been a very anxious person. I’ve noticed on my FI path that my anxiety has decreased when it comes to money. I feel like a weight is lifting off of my shoulders, and I’m not worrying about the distant future as much. 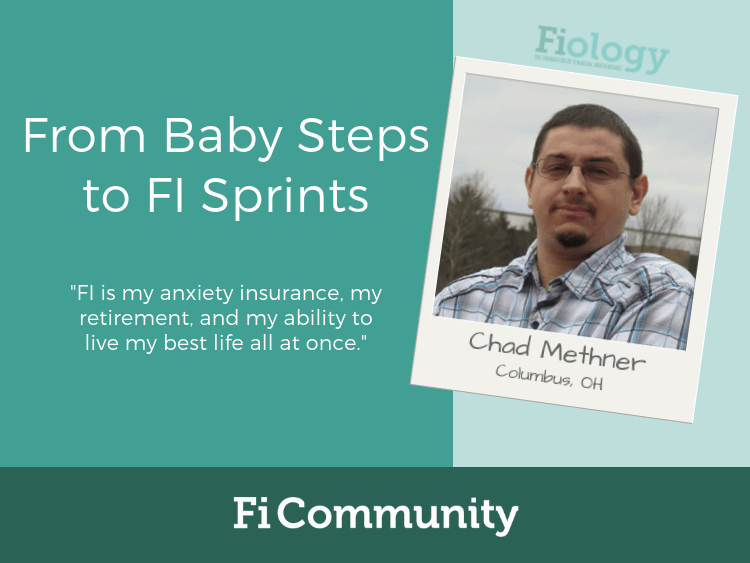 FI is my anxiety insurance, my retirement, and my ability to live my best life all at once. As a fun FI goal, I think it would be nice to be a part of the millionaire club. Thank you for sharing your story. There are probably more people that can connect with you than others who are closer to FI or have already achieved FI. The struggle is very real and you explain that so well in your story. You mentioned that you took on quite a bit of debt even after reading Dave’s book and continued to try and keep up with the Jones’. This is what the majority of the population struggles with. If we are reading this blog, we know what we should be doing but we have an immensely difficult time actually putting these steps into action because the world is telling us otherwise. However, you my friend are a wonderful success story that will catapult others in your past position to new heights on their FI journey. I liked that you mentioned the anxiety that can come with debt. It definitely has an impact on our health. I distinctly remember the moment I click the authorization for my final student loan payment and I suddenly felt tranquil. Which then progressed to elation. I hadn’t realized they they were stressing me out daily. I really hope you get to experience this soon. When I was paying off debt I would listen to Dave Ramsey on my train ride to work in the morning, so I can relate. I wanted a reminder to pay off debt and hear inspirational stories including the debt-free screams.